After months of robust and seemingly unsustainable annual home value appreciation, the housing market is showing signs of moderation in the first quarter, according to data from Zillow. The Zillow ($58.60 -1.19%) home value index increased 5.1% year-over-year to $157,600 as of the end of the first quarter. March marked the 16th consecutive month that U.S. home values rose, although last month marked the second straight month of slowing annual appreciation. Additionally, home values appreciation was 0.5% in the first quarter, compared to 2.1% in the fourth quarter of 2012. Typically annual home values appreciate roughly 3%, according to research done by Zillow. The Zillow Home Value Forecast anticipates national home values will rise 3.2% through March 2014, indicating an appreciation more in line with historic norms. However, in some local markets, home values continue to rise at a rapid pace. According to Zillow, five markets it covers saw a year-over-year appreciation of more than 20%: Phoenix (up 24%), Las Vegas (up 22.3%), San Jose (up 22.1%), San Francisco (up 21.4%) and Sacramento (up 20.1%). “The national housing market has rebounded strongly over the past year. But the sometimes dramatic home value run-ups experienced during these months were never expected to be sustainable, and recent slowdowns are indicative of a market that is slowly finding its natural level,” said Zillow Chief Economist Dr. Stan Humphries. 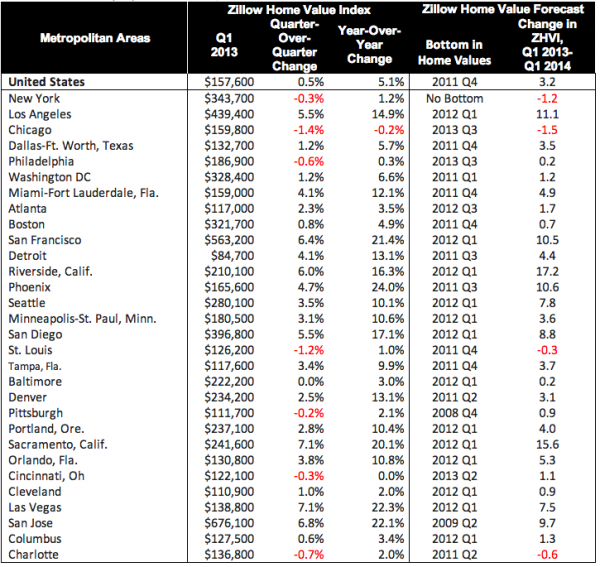 Surprisingly, seven of the top 30 metro markets that Zillow covers experienced a home value decline in the first quarter. New York metro’s home value dropped 0.3% after three consecutive quarter of positive appreciation. Chicago saw the largest depreciation as values fell 1.4% in the first quarter after falling flat in 2012’s fourth quarter.